How many of you have bought Kathleen Pederson’s Fix It Up! Sentences for Grammar, Sight Words & Handwriting? Well if you haven’t, let me tell you that it is an awesome resource! My students loved the fix it ups! 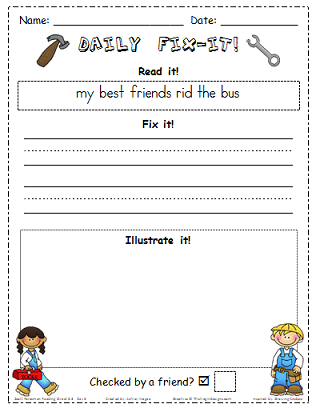 I saw where Laura from First Grade Fundamentals posted fix its for StoryTown, so I decided to create some for Reading Street! Even if you’re not using Scott Foresman Reading Street (or this pre-common core version), you may still find these useful as they are just simply sentence editing sheets! Note: These used to be available for download on Teachers Pay Teachers and Teachers Notebook. They are now available on my website only. These are SOOOOO great. Thank you so much! My district doesn’t use Reading Street but I still will use these for my morning work. I love these way more than what I was using! Thank you! You are my hero!!! I use Reading Street and I like this way better than the others! Thanks for sharing!! I have to look at your other activities…big fan! We use Houghton Mifflin, but this is a great resource to help me figure out how to make printables for our series! Also, thank you for contributing to the Teacher to Teacher giveaway! Thank you for sharing great ideas. I love it. Wow! I can’t wait to use these on my smartboard next year! So generous of you to share. I will be purchasing your SF resources on TPT as well. Thanks again! These are great!! Also, thanks for the great opportunity on the mega giveaway from Teacher2Teacher! Thank you – they’re marvelous. Also, thanks for the chance to participate in the giveaway. I love these, but we don’t use the same series. You’ve inspired me to make some based on our Treasures reading series! Thanks for the inspiration. I also entered the awesome T2T giveaway! I love what you have done here – I will share it with the teachers who have older kids – I am a toddler teacher – but I can certainly adapt things to work for me! Thanks for sharing! One of my teammates if moving from second to first. She’ll love your site! Thanks, also, for participating in the big giveaway. This is AWESOME! My school is using Scott Foresman and this will be my first year teaching first grade! Thank you for participating in this awesome contest! I teach grade 2 and use Reading Street-love your ideas! I love your stuff and just purchased your spelling and read/roll activities but when I opened the files some of the fonts were blurred out. I wanted to email you offline but couldn’t find your address. Could you email me the names of the fonts you used? Thanks. The fonts that blurred were on the word search and making words sheets. I’ve emailed you about your issue with the fonts. Sorry you had trouble! Please reply to my email when you receive it! love these!!! ive been using SF for a few years, your fix its are much cuter then mine! Glad to have something refreshing to look at!!! I have been trying to download these (LOVE EM!) but when they unzip on my Mac the printables show only the template part (picture, outline of boxes etc) and no text/sentence lines. Any idea what is going wrong? You rock! Thanks a bunch! I’m a grade one teacher in MA and would love to get my hands on a copy of your SF Reading Street Daily Fix-its. I had attempted something similar in my classroom and then came across yours. They are really cute. I did go to Teacher’s Notebook, however, I am not a member and can not get access to them. What do you suggest? I have to tell you that I absolutely love your Roll and Read. I use it as a center activity and the kids love it. You have posted amazing things. Thank you! They are too big to send through email. However, it is free to sign up at Teacher’s Notebook. There is no cost to download free items and signing up does not mean you are signing up to sell. Hi! I LOVE your daily fix-its and want to implement them in my kindergarten class. I tried using the treasure passwords provided on your blog to download them, but nothing happens. It stays on the same page (with the pirate brain). Is there another trick to this that I’m missing? Thanks for the help and the great resources! Did you make sure to type the password in all capital letters? That is the correct password, so after entering it, it should take you to the page where all the resources are listed and available for download. Do let me know if you need more help by replying here or emailing me at ashleymagee@firstgradebrain.com so I can help further! Or do you mean you’re on the page with the resources listed and you’re typing the passwords for each fix-it into the box? If that’s what you’re doing, each daily fix it has a different password (listed on the right of the screen, or at the bottom on a mobile device) and you just type it in, press go/enter and after a few seconds (maybe longer depending on your internet speed) it should pop up asking you to download (they are zipped files). Save to your computer, after downloading right click on them to extract the files, then open the extracted files. Let me know if you do need more help and I’m happy to help!